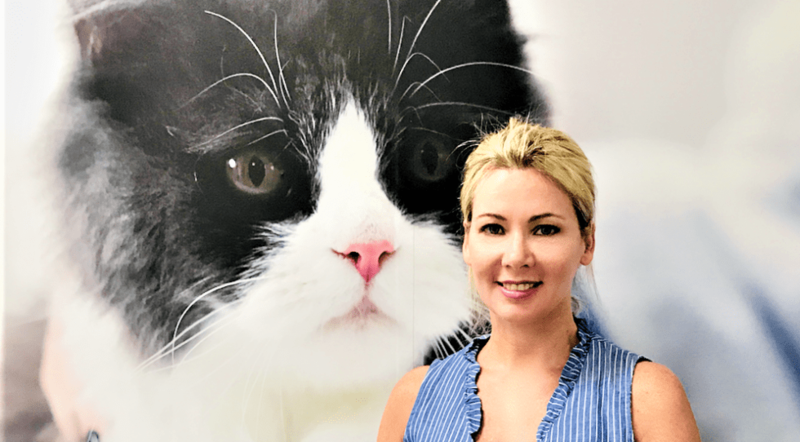 Cat behaviorist Mieshelle Nagleschneider travels the world as a keynote speaker and animal welfare-advocate on a variety of issues, including kitty litter. 1. Treating cats as if they’re dogs. It’s hard to imagine a cat playing fetch, or a dog spending its waking hours preening, so why would we expect the same behaviours from our fur babies when it comes to housetraining? According to cat behaviourist and author of The Cat Whisperer, Mieshelle Nagelschneider, a “one-size-fits-all” approach to raising four-legged friends can have disastrous consequences. “We can end up creating cat issues—and making a lot of existing issues worse—by treating them like dogs,” she says. “Cats are a little bit more wild—they’re not fully domesticated, and still have many of their wild cat instincts.” These instincts help explain some of the more curious behaviours exhibited by housecats, including perching high (a means of keeping an eye on potential predators) and fussily refusing to drink day-old water (they’re hard-wired to be wary of bacteria). 2. Only providing one litter box. It’s not just fresh water that felines tend to fuss over. It turns out they also prefer having more than one litter box to choose from. “In nature, cats like to separate their urination and defecation behaviours,” explains Nagelschneider. “In the home, having just one box where there’s both urination and defecation can cause a cat to urinate outside of the box.” Her rule of thumb is to provide one litter box per cat, plus one more. “For example, if you have two cats, you need three boxes,” she says. 3. Putting all of the litter boxes in one room. Nagelschneider stresses the importance of distributing litter boxes throughout the home. “Multiple locations actually trump the number of boxes,” she says. “If you have five cats, but can only have three boxes, it’s essential that those three boxes are located in different areas around the house.” Why the need for separation? According to Nagelschneider, it goes back to a cat’s territorial instincts. “It’s like 10 roommates trying to use one bathroom in the house. After a while, you’re going to start getting irritated with them,” she says. Competition over household litter boxes can cause lasting damage, even causing cats to unfriend each other over time. Fight the urge to cluster all of your cat’s accessories—from scratching posts to perches to beds—in one designated “cat room.” According to Nagelschneider, scattering pet paraphernalia around the house more accurately reflects conditions in the wild, and creates what she calls a “land of plenty”—an atmosphere that reduces competition between cats. She even recommends separating the food bowl from the water dish, as cats instinctively avoid water near dead prey, which in the wild would likely be contaminated with bacteria. 5. Buying a covered litter box. Unlike humans, cats don’t need privacy in order to do their business. In fact, according to Nagelschneider, the complete opposite is true. “In nature, cats don’t urinate in hollowed-out logs or behind bushes,” she says. Instead, they’ll opt for a relatively exposed, open location that affords them a good view of potential predators. “They always need to have a good escape route handy,” she says. Indoors, that translates into a litter box that’s open on all sides. 6. Not scooping cat litter often enough. Even if your feline friends have never experienced the great outdoors themselves, they still possess the survival instincts of their wildcat ancestors. One of the strongest of those instincts is the need to bury their own waste; a habit that effectively throws predators off their scent. Once indoors—and restricted to the use of a litter box—a housecat’s attempt at burying only does so much to mask the scent; hence the importance of regular scooping. “Once a week simply isn’t enough,” says Nagelschneider. “Even with a good clumping litter like Arm & Hammer Clump & Seal Slide, you should be scooping daily, and replacing the litter completely every 30 days.” According to Nagelschneider, fresh, clean litter is the best way to prevent messes outside the litter box, and that has consequences on a large scale. “A third of all cats surrendered to shelters are there for litter box issues,” she says. 7. Failing to foster a family vibe. In order for cats to live harmoniously under one roof, Nagelschneider says it’s important for them to recognize each other as family—regardless of whether or not they’re actually related. Humans can help in this regard by facilitating the spread of what’s known as “group scent.” “If you have a five-cat household, you’ll want each cat to have the scent of all five cats on them,” she says. “This shared scent is like a family’s last name.” Spreading this group scent is as easy as brushing each cat in the household with the same brush a few times each day. Not only does the process foster friendlier behaviour between cats, but it also encourages better sharing of litter boxes, as well. She is available for owner consultations via her website. I wont use any other brand of litter except for ‘Cedarific’ which is soft cedar shavings.